Clowns may at first seem to be fun, happy characters, but evil clown costumes embody the darker side of merriment. While the first impression of a traditional clown may be one of frivolity, the exaggerated makeup, clothing, expressions, and actions of even the happiest clown can be frightening, particularly to young children. Circus clowns often interact unexpectedly with the audience, and an ill-timed prank or joke can add fear to what is meant as a happy event. 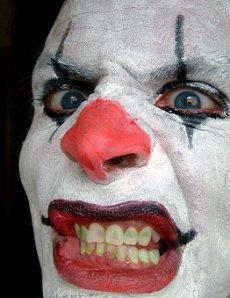 Because of these experiences, many people develop coulrophobia, or fear of clowns. That fear is exaggerated with the image of the evil clown, and in fact, many horror movies capitalize on such fears by casting clowns in roles as killers, kidnappers, and other villains. The image is even scarier when compared to the original intention of a clown-an evil clown truly is a good, fun character gone horribly bad. This makes evil clown costumes perfect for Halloween, masquerade parties, and other events where the wearer wants to shock other guests with a twisted, unexpected persona. There are many elements to an evil clown's appearance, and careful attention to different details can create a viciously terrifying effect. Clown wigs are often bright, fun colors, but evil clown wigs should have more threatening tones. Instead of opting for pastel rainbow wigs, choose a bold red or blue wig in a solid color. Adding dirt, snarls, or singed edges to the hair will give it a less wholesome appearance as well. A matted, unkempt hairstyle immediately signals that this clown isn't the fun-loving character he or she may seem to be. The exaggerated features of a clown face are familiar to everyone, but with subtle changes, the makeup can greatly enhance evil clown costumes. Use bold, darker colors-maroon instead of cherry red, for example-and craft expressions with sharp angles and harsh contrasts. The eyebrows and lips, in particular, should be sharply angled to convey a severe expression even for a smile. Black lipstick and dark eye sockets can add a sinister look, and green or yellow rotten teeth, a well-placed wart, or even skeletal features can create a superbly scary face. Pointed teeth, sharp pointed nails, and scars can all be great makeup details for an evil clown. Most clown costumes are bright and cheery, with fun colors and bold shapes. An evil clown will wear similar garb, but the outfit may be stained, tattered, or patched. As with the makeup, the colors should be more muted-mustard instead of canary yellow, sage instead of emerald green-and the frilliest collars and other details may be missing or grossly damaged. Furthermore, an evil clown is not usually the pudgy, fun figure most people are familiar with-a slender clown inherently seems more sinister. Only an evil clown would carry a rotten pumpkin. Instead of carrying balloons or brightly colored flowers, evil clowns may tote whips, knives, nooses, or other weapons with which to torture their victims. 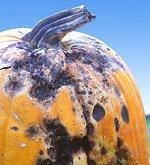 A rotten jack-o-lantern is another great Halloween prop for an evil clown costume. Many clowns are known to carry cream pies for the famous pie-in-the-face gag; an evil clown would carry a moldy or black cream pie instead, or perhaps rotten tomatoes. A costume alone is not enough to create a sense of evil and horror. To properly portray an evil clown, the wearer must behave accurately-instead of being fun and frolicky, an evil clown would be cold, menacing, and calculating. A good "evil eye" stare is essential, and slow, deliberate movements are sure to strike terror into other guests. Alternatively, an evil clown may be more aggressive than normal, starting out with a joke but growing belligerent and cruel as the game progresses. It is possible to buy wicked clown costumes from most Halloween costume shops and retailers, but many individuals prefer to take a basic clown costume and add their own details to turn it evil. That personalization will make the costume even more authentic because it will be clear that the good clown turned bad. Most details are inexpensive to create and can be a fun way to create homemade costumes. Everyone has both good and bad in them, and evil clowns portray the dark side of the best people in horrifying clarity. With great attention to detail-from the colorful wig to the floppy shoes to the clown's behavior-it is possible to be the scariest jokester on the block.